If you’ve been to a fine jewelry store, you’ve probably heard or discussed “carats”. But you’ve probably also discussed “karats”. So what’s the difference? The terms karats and carats are both used to refer to bling in the jewelry trade and in geology, but the words don’t mean the same thing. A carat is a unit of mass used in the jewelry industry to describe the weight of diamonds and other gemstones. Carat is a term used by the public to determine the size of a diamond it has become the norm for the public to talk about diamonds using carat to discuss the size of a diamond. We often tell people that unless two diamonds are cut the same they may look the same looking down from above but in fact weigh very different amounts. One carat is equal to 200 milligrams or 0.2 grams. To put this into perspective, a pound is 453 grams or 2264 carats. A 2-carat diamond would weigh 400 mg. Gemstones have different densities, so 1 carat of one stone might be larger or smaller in volume than 1 carat of another material. A carat may be divided into 100 points, each with a mass of 2 milligrams. The abbreviation for carats is CT or ct.
A karat is a term used to describe the purity of gold. A karat is 1/24th of a portion, so 24 karat gold is pure gold. 14-karat gold is 14 parts gold and 10 parts other metals. 18-karat gold is 18/24 parts gold or 75% gold. Pure gold is very soft, so it’s usually mixed with other metals to form an alloy that’s hard, less expensive, and sometimes has a different color. The abbreviation for karat is K or k, as in “14k gold”. So 1 Karat is 1/24th of pure gold. For 18 Karat yellow gold the mix is 75% gold and then a mixture of approximately 5% copper and 20% fine silver. For 18 Karat white gold the mixture is 75% gold and then 25% palladium or platinum. For 18 karat rose gold the mix is 75% gold and then 20% copper and 5% fine silver. *These mixtures are just an example. Different manufactures of jewelry will make their own mixes and obviously some are better than other and some also claim to be better/superior than others gold. Prices may vary accordingly. 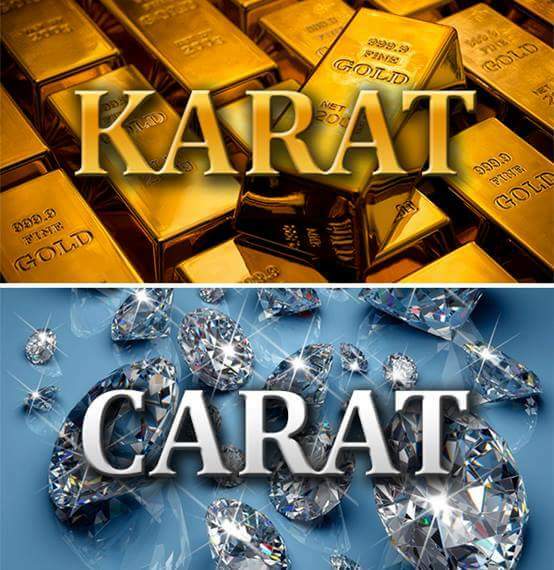 Now that you know the difference between a karat and a carat, visit our fine jewelers in Redwood City to browse our selection of jewelry today!